Adeline Rwigara (left) and her daughters Diane Rwigara (centre) and Anne Rwigara are escorted by security officers to a police van after a Kigali court adjourned the pre-trial hearing in which they are facing criminal charges on October 9, 2017. 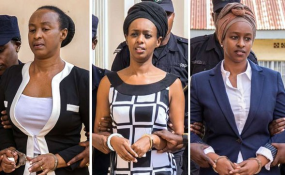 A court in Rwanda wants four other people tried with government critic Diane Rwigara and her mother Adeline Rwigara for conspiring to incite insurrection. A judge made the request as the trial of the Rwigaras resume in Kigali on Monday. But the defendants' lawyers argued that the request, if granted, would delay the trial. The four individuals were identified as Ms Tabitha Mugenzi, an aunt of Diane who resides in Toronto, Canada, Mr Xaverine Mukangarambe and Mr Jean Paul Turayishimiye in the US and Mr Edmund Musheija in Belgium. The prosecution said the suspected crimes were committed jointly by all the six, hence the need to be tried together. In several Whatsapp audios leaked to the press last year, Diane's mother is heard speaking with individuals, who the prosecution said were the four. It is not clear yet how the Kigali court would the four to appear for trial, or whether it would seek their deportation from their host countries. The trial, however, failed to resume in substance, after Adeline's lawyer, Mr Gatera Gashabana, requested that it be postponed since he had another case to attend in the Supreme Court at the same time. It was postponed to May 22. Diane and her mother have been held in detention since September last year when police stormed their residence in Kiyovu, Kigali and arrested them. The Rwanda Revenue Authority (RRA) in March auctioned property owned by the family for $599,040 (Rwf512 million), in a bid to pay off more than $5.85 million (Rwf5 billion) in tax arrears. The Rwigara family's troubles began last year, shortly after Diane launched an unsuccessful bid to compete against President Paul Kagame in the August polls. She was disqualified by the electoral commission and charged with inciting insurrection and forging signatures required of presidential candidates. Her mother was also charged with inciting insurrection and promoting sectarianism.